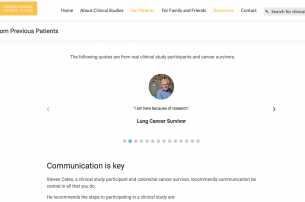 In 2016, the STEM Translational Communication Center partnered with HealthStreet, a community-engaged program of the CTSI, to create community forums that focused on cancer clinical studies. Each forum centered on a specific type of cancer, lung, colorectal and breast, and included a panel of experts such as a research coordinator, breast cancer survivor and oncologist. The panel discussed the benefits of participating in clinical studies, the impact it has on furthering cancer research as well as real-life testimonials from clinical study participants. Topics discussed amongst the panel and community member questions revealed that there is a lot of work to be done in presenting clinical study information to the general public. Participation in cancer clinical trials is critical to advancing patient care. Yet, the decision to participate can be difficult for patients and caregivers. Individuals affected by cancer are increasingly turning to the Internet to locate information about the disease and treatment options. A simple Google search for cancer information can yield hundreds and thousands of results. There are certainly benefits to this widespread availability, but with evidence supporting that cancer decision-making is emotion-driven, it was important to the STCC to discover how individuals seek information and make decisions about treatment. Message tailoring – the practice of designing messages at the individual level is one way to increase intentions to engage in cancer-related behaviors, such as participating in clinical studies. Previous research demonstrated that treatment decisions are not exclusive to the patient, but often involve the caregiver as well. In this study, we examined if priming patients and caregivers to perceive that web-based materials about cancer had been tailored to their preferences influenced emotion surrounding cancer treatment and cancer decision-making. 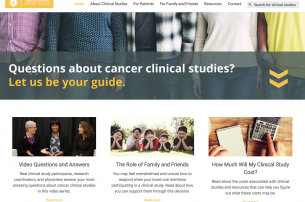 Patients (n = 105) and caregivers (n = 105) were asked to provide insight on a website created for cancer patients to help them make better decisions about treatment. Prior to viewing the website, participants answered questions about their website preferences (e.g., “Do you prefer webpages with downloadable resources?”). Patients and caregivers were randomly assigned to one of two message conditions. Participants in the Perceived Tailoring Condition (PTC) were instructed to view a personalized website whereas those in the Non-Tailored Comparison (NTC) were instructed to view a website. Participants completed a post-test survey with measures assessing perceptions of tailoring, emotions surrounding CCTs, and intentions to seek information about CCTs and participate in a treatment registry. In other words, participants who perceived the web-based materials had been tailored to their preferences experienced stronger positive emotions about CCTs and were significantly more to express an intention to seek cancer information and to enroll in a cancer treatment registry. Our results advance theoretical knowledge regarding the underlying mechanisms of tailoring and have implications for developing web-based materials about cancer and designing cancer treatment interventions. The website homepage summarizes the website purpose with a large header image and arrows that point the user to main sections of content. Diverse, high-quality images are used on the homepage and throughout the website. Throughout the website we included graphics that include a quote and photo from a real clinical study participant. 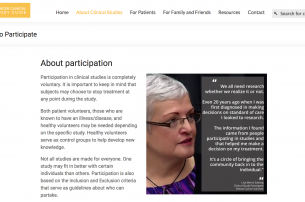 A rotating slider on the website shows testimonials from real clinical study participants.